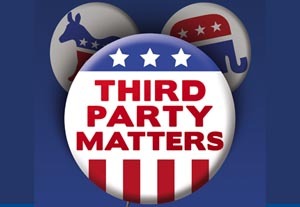 Third party candidates are frequently overlooked in the United States political system. Often times, third party candidates struggle to gain traction due to low name recognition or lack of funding. However, 2016 has presented a unique opportunity for third parties in the United States. Donald Trump and Hillary Clinton are the two most unpopular presidential candidates in the history of modern U.S. politics. Their unpopularity has led to eye-popping poll results for candidates Gary Johnson (Libertarian), Jill Stein (Green), and Evan McMullin (independent). In this article, I will explain to you why a third party vote is NOT a wasted vote. Is a Third Party Vote a Wasted Vote? To answer this simply: no, a third party vote is not “throwing your vote away.” This line of rhetoric is based in the reality that no third party candidate can realistically win the presidency in the current U.S. political system. The Electoral College is a first-past-the-post system, meaning whichever candidate passes the “post” (in the case of a U.S. Presidential election, the post is 270 electoral votes) wins. Often times, third party candidates are considered “spoilers,” meaning that a third party candidate will “steal” votes from the major party candidate with similar views. The most recent and relevant example of this “spoiler” effect can be studied in the 2000 election, where Green Party candidate Ralph Nader won 2.7% of the vote. Nader received 22,000 votes in New Hampshire, while Al Gore, the Democratic candidate, lost the state by approximately 7,000 votes to Republican candidate George W. Bush. If Gore had gotten those votes instead of Nader, Gore would have won New Hampshire and the 2000 Presidential election. If anything, this case shows exactly how significant a third party vote can be. From a purely democratic perspective, there is no such thing as a “wasted vote.” By voting for any candidate, you are fulfilling your civic duty and participating in a democratic election in the hopes of electing a politician who best represents the values and policies you wish to see brought into law. But if a Third Party Candidate Cannot Win, Why Should I Bother Voting for One? Minor party candidates have a lot to gain from strong election performances. Earlier in this article, I touched on how minor party candidates are at a disadvantage in terms of funding. Unfortunately, candidates need absurd amounts of money to run successful political campaigns. Well, by voting for a minor party candidate, you can increase their chances of receiving partial public funding for general election campaigns (for a full breakdown, scroll to the “General Election Funding” subheading). Any party that has a certain number of registered voters has automatic ballot access. Any party that got a certain percentage of the vote in the previous general election get automatic ballot access. Clearly, registering or voting for a third party candidate can help that third party grow, which is crucial if that third party wants to remain relevant in the United States political system. Minor party candidates can also get on the Presidential debate stage if they poll at 15% or more in five “selected national public opinion polling organizations.” Although these polls are not necessarily directly related to the final voting results, the logical assumption is that an increase in citizen voting third party will result in higher polling result for third party candidates prior to the election. The purpose of this article is not to convince you vote for a third party candidate. Rather, my goal is to help voters understand that all votes have some inherent value, regardless of the candidate’s probability of winning the election. Every vote, even a third party vote, is worth casting, so do not be discouraged when you get to the ballot box, even if you know your preferred candidate cannot win.